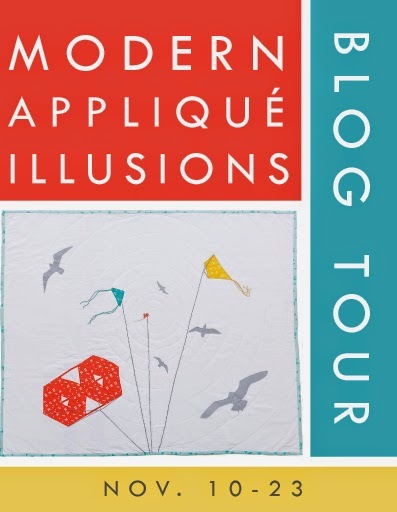 Today I’m so happy to be participating in Casey York’s blog tour for her new release: Modern Applique Illusions: 18 Quilts CreatePerspective & Depth. I’m so happy that more books are coming out on modern appliqué! I think it’s a truly underserved part of quiltmaking and one that has the most potential for creative expression! Casey’s book is about perspective and illusion. Each quilt, although very minimal and modern, packs a huge visual punch done with techniques borrowed from the art world – perspective, depth and shadow. Perspective is the illusion of depth achieved through line and space. Perspective makes a flat surface look 3-D. Depth is a word often talked about in quiltmaking. Typically, in traditional quilting and modern scrap quilting, depth is achieved through color placement – light colors recede and dark colors advance. Depth makes a quilt more interesting to look at. And shadow makes elements pop off the quilt. Casey’s designs are full of perspective and depth. The book is broken out into Architecture, the Natural World and Concepts. She uses all the concepts above to make her quilts look like no other modern quilts I've ever seen. It truly is a brilliant blending of art and quilts! As part of the blog tour, Casey asked me to make a project based on one of her quilts. I chose the koi from “Ripples.” We have a koi pond at my house and I love watching them glide through the water, occasionally popping up to beg for food! They are so beautiful and calming to watch at the end of the day! 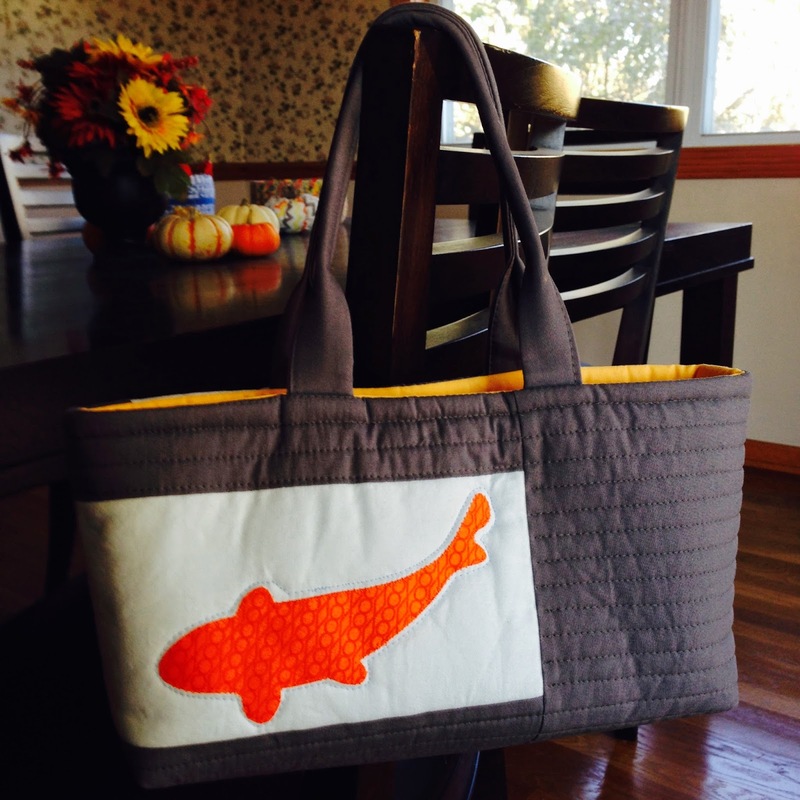 For my project, rather than make the quilt, I chose to take the fish from “Ripples” and make a purse. It was a fun project to make! 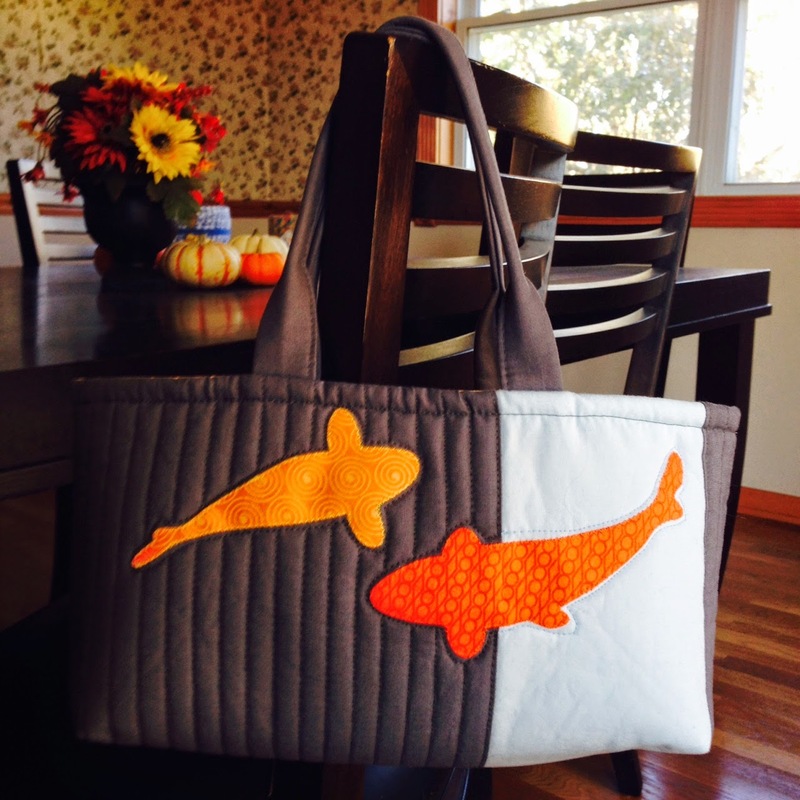 I chose two of the koi templates and appliqued them with fusible web and a loose zigzag stitch in matching thread. I used my favorite modern color combo – orange/blue/gray for the outside and lined it with a bright orangey-gold. You probably noticed that I didn’t use the shadow for my koi – my thinking was that there wasn’t enough room on this small purse for the shadow to be effective. In hindsight, it probably would have been okay. Just chalk it up to one of those real-time decisions that didn’t pan out! But it’s still a fun purse and I plan on using it everyday! Of course there are 17 other projects in the book to choose your next project from. I think next to “Ripples,” “Chicken Scratch” is my next favorite. I grew up with chickens and miss the fresh eggs. (Although I’d be hard-pressed to butcher a chicken for dinner today!) But what I love most about the quilt is Casey used 30s reproduction fabrics in her modern quilt. I’m a big proponent that modern is what you make it, and Casey must agree! No rules for her either! For your chance to get a copy of this fabulous book, leave a comment below saying something about the book! Be sure I can get ahold of you if you’re the winner. I’ll post the name Friday, Nov. 14. Here’s the entire tour. 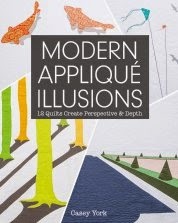 Be sure to go to each blog to hear more about Modern Applique Illusions and enter for a chance to win more prizes! Today is the first I've seen this book. Can't wait to see more! I love this! I'm excited about seeing more of it. I love art quilts. I love the kite design. I would love to make a kite quilt! What a cute bag! I've seen Casey's posts about the book and every project looks amazing! 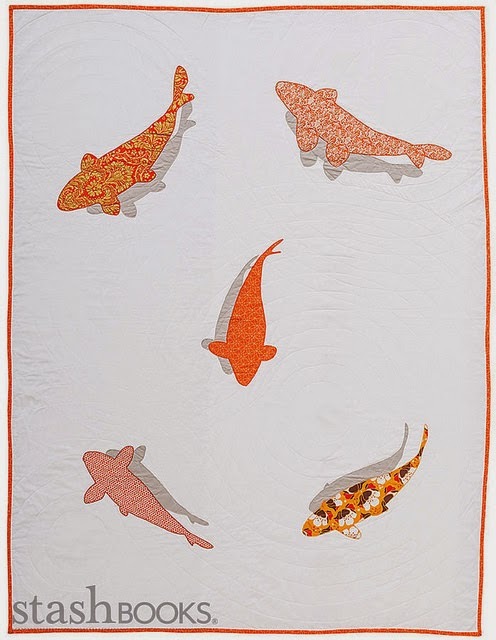 I love your koi quilt! Looks like a fun book!! I love books of all kinds and have a good selection of quilt related books:) can always use more tho!! This applique looks so cool! I would love to have a chance to win a copy! Thanks so much for the giveaway! Love the trees and the shadows. Thanks for the chance. I am very interested in applique on quilts! I'd love to learn and make something creative and different! I think this will be a must have book. Just learning applique. Looks like a great book to get a lot of neat ideas from! I like the concept of adding the shadow illusion to my applique. Would love to read more about it in Casey's book. Thanks for the review and the chance to win a copy. Looks like a fantastic book, and a must have for me! Love the way everything looks like it's floating in air. I would love to own this book. I love the idea of modern landscapes. This is a great book to learn modern perspective with and enjoy the process. This looks like such an amazing book. HI, the kite design in this book is so neat! Thanks for a great giveaway! Applique hasn't been something I've wanted to try until now. Thanks for the great inspiration! I am an absolute novice at applique, but this book is tempting me to take the leap. Love the koi! I also love architecture. Love the trees and their shadows. Looks like a neat book, love the goldfish! I love a great, new book. IF I win, it's being donated to my guild's library just as soon as I take a quick peek. I know it'll good to the library since I'm the librarian next year. Thanks for the opportunity to win and share a great applique book.